Photovoltaic solar panels are connected directly to the inverter which, in turn, feed the DC bus drive. The functioning of the inverter bridge and the performance motor output are not affected and can operate the inverter and the motor unrestricted (start-up curves, motor protection and protection of pumps …). The inverter operates mainly in isolated systems, for locations with electrical network and all engine power is provided by the photovoltaic field to direct water extraction for irrigation and / or filling pools. The result: with a minimal cost, immediate energy and cost savings is provided, which added to the high control performance, safety, reliability and durability make the project efficient from a technical and economic point of view. 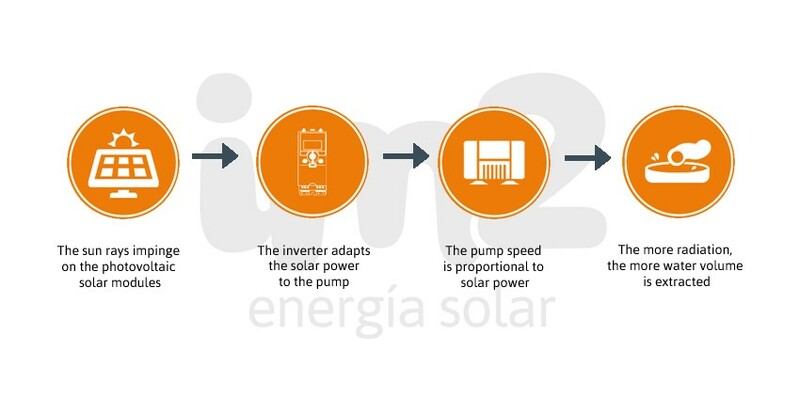 Photovoltaic energy generated in the panels is injected fully into the engine, consuming from the generator, if necessary, the remaining energy needed to operate under normal conditions. The savings are obvious and proportional to the photovoltaic power installed since solar energy is limitless, clean, green and free. Are you interested in installing a solar pumping?